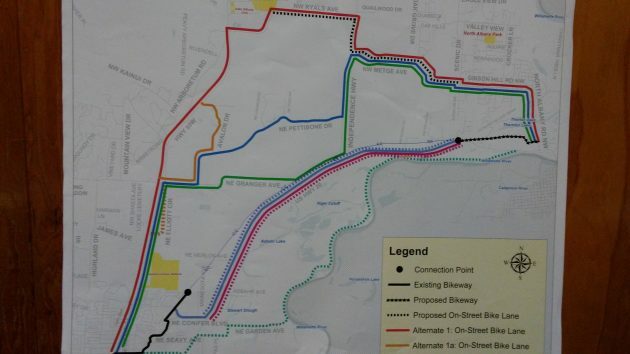 These were possible routes unveiled at a meeting Dec. 13. Benton County will keep going with a study to see if there’s a feasible way to build an Albany-Corvallis bike route without stepping on any land owners’ toes, the board of commissioners voted this afternoon. Newly sworn Commissioner Xan Augerot joined Commissioners Annabelle Jaramillo and Anne Schuster in deciding to go ahead with Phase 2 of the Albany-Corvallis Bikeway planning effort being conducted by a consulting firm. Augerot was elected in November to replace Jay Dixon, and Jaramillo was re-elected. The county launched the latest study after a previous plan to route a bikeway along the rail line used by the Portland & Western was shot down in early 2015 because of objections by farmers along the way. Phase 1 of the new study tried to identify other routes and came up with eight possibilities, including bike lanes on the Albany-Corvallis Highway (US 20) itself. Now, Phase 2 will try to determine whether there’s one that’s practical and also meets several criteria, such as being safe, compatible with land use law, and “environmentally friendly.” Cost will be a major factor too. At a well attended community meeting on Dec. 13, Benton County Public Works Director Josh Wheeler said the former route along the railroad was off the table and the county was not interested in any route opposed by landowners. This next phase is to be finished by spring. If it comes up with a feasible and acceptable route, the third and final phase of the study will be an engineering analysis. When they approved a contract with consultants Barney and Worth of Portland last spring, the commissioners were told the three-phase study would cost no more than $150,000, with the state contributing $50,000. The route would cover about seven or eight miles from Scenic Drive in Albany to the northeast corner of Corvallis, where a short section of the path already exists north of Conifer Boulevard. 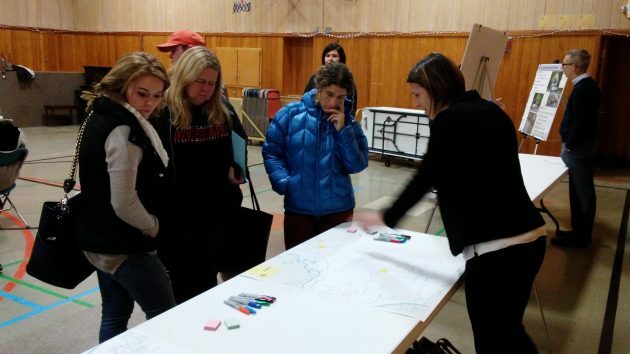 People got a chance to comment on potential routes last month. To offset the prodigious expense involved in the proposed path-building project, perhaps the Corvallis-to-Albany bicycle thruway could sport toll booths at either end. User-fee financing would take the painful financial onus off of the vast majority of taxpayers who will never use this wonderful trail. Equally important, the Albany ruling class could get behind the idea because of the CARA-guarantee return. Last, but not least, the audacity in extending CARA’s reach nearly into the heart of Corvallis is powerful ju-ju. This may fall somewhat outside CARA’s mandate, but perhaps that august body could initially finance the bike trail build-out. Once bike traffic commences, CARA would collect User Fees at the toll booths. In the interest of cross-marketing synergy, any Merry go round creatures not destined for downtown could be installed at the bike path entryways acting as colorful toll booth deposit jar….piggy banks comes to mind. I’ve never been to your house, but I assume it’s accessible by a road that I’m helping to pay for. Unless you want tolls on every stretch of roadway, it’d be best to leave transportation infrastructure up to government decision making and financing with help of informed public voting on their representatives and commenting on their proposals. CARA doesn’t cross into Benton County and I don’t know that there’s any proposal to use TIF to finance this project (although it might be a workable idea), so I’m not sure what you’re on about there. Because we live in an era where truth no longer matters and the President-elect receives awards from convicted felons on New Years Eve (Trump-Mar-Lago NY Eve 2016) it seems that faux-info has even found a niche in Hasso Hering’s daily musing. I thought my message was tongue-in-cheek enough that most would view it for what it is. Apparently it was not fake enough. That’s right “joey no socks”. Where are we heading in this “country”??? Fair enough. I don’t get into the comments section often. And Poe’s law is needing some addenda in the era of Trumpiness. Yeah, I like your idea. Stupid waste of money from the build down to the $150,000 study. 1 – Too far out of the way and/or too hilly for easy regular travel between Corvallis and Albany(Linn County part). 2 – Too close to Hwy 20’s noise and ugliness. As I drive along the streets of Albany most days of the week, I’m struck by the dearth of bicyclists out and about, even in Summer. It’s an absurd proposal to spend millions of taxpayer dollars to benefit the few people using bicycles, even granted users are likely to increase. Though Hartman is probably writing tongue-in-cheek, it would be useful to examine how many actual users of such a bike path are willing to pay for it themselves, and not mulct the non-users for their self-serving quest. I would be gratified to see a creditable study about the actual numbers of bicycle riders, month over month, year over year, between Albany and Corvallis. I also thank Hasso for his willingness to print negative opinions for what is a project dear to him. The real question is — would the “path” i prove use and (dare I day it?) pull pollutants out of our air????? Hey, this is what Benton County does best; hire consultants, planning, and spending money. Actually achievement; not so much. And yes, I speak with first-hand experience.